RockBrawler II Hi-Lift Jack Mount. For Jeep Wrangler JK 2007-2016.This accessory makes it easy to mount a Hi-Lift jack to your Poison Spyder RockBrawler II Rear Bumper with Tire Carrier. 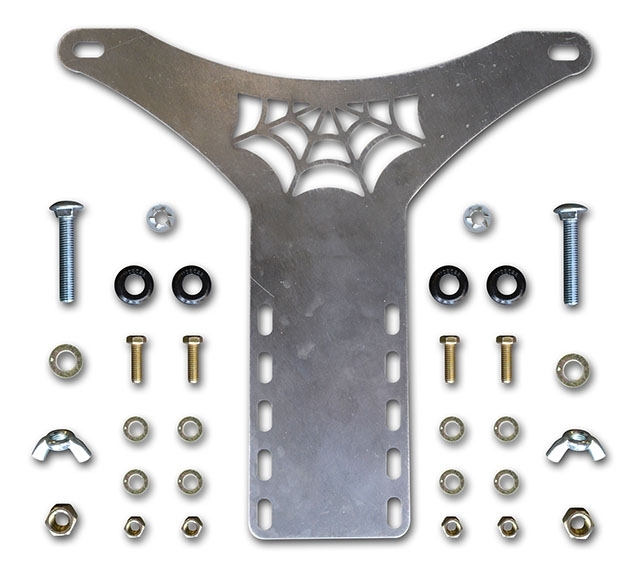 The mount plate is CNC laser cut from 1/4 inch plate steel, with an unmistakable Spyder web design. The plate bolts to the top of the tire carrier using the supplied Grade 8 hardware. Your Hi-Lift jack attaches to the mount plate with a pair of heavy duty 1/2 inch carriage bolts with urethane isolator bushings. We provide both wing nuts and nylock nuts so you can choose which to use to fasten your Jack to the mount. The RockBrawler II Hi-Lift Jack Mount comes bare steel so you may paint or powdercoat in the color of your choice. II Rear Bumper with Tire Carrier. If you have a RockBrawler Rear Bumper with Tire Carrier, you need our Rock Brawler Hi-Lift Jack Mount instead.